In a recent on-line debate sponsored by the Arizona Republic, Mayor Lewis accused me on not being on speaking terms with the Gilbert Chamber of Commerce and Small Business Alliance. He apparently drew that conclusion when I contacted both organizations and told them I would not accept their endorsements. I have decided not to accept special interest endorsements. A fair question is "Why"? The Gilbert Chamber claims 600 members and you might assume each gets a ballot which is returned, tabulated and a endorsee chosen. That isn't how it works. 12 members of the public policy committee make the decision for all 600, 588 of the members have no say what so ever. See the problem? The process is the same for every special interest group. I don't know of any of these endorsing groups that poll each of their members for a preference on endorsement. In the big picture if candidates have a record in office that is probably a better indicator of what you can expect from them if elected than any endorsement. In this election you have two mayors with records in office. 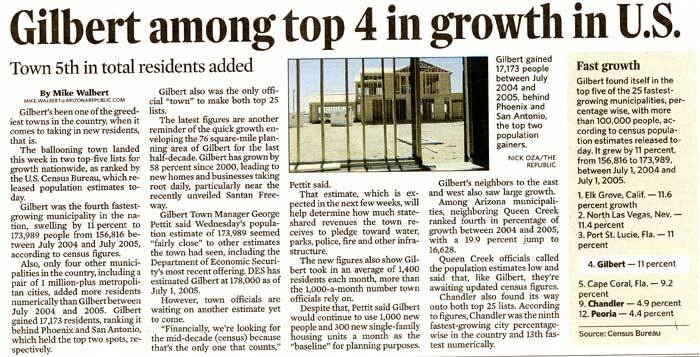 If you remember when the news headlines were about companies coming to Gilbert, not leaving, please vote for me. If you remember when Money Magazine, Business Week, and CNN ranked us as the best place to live in Arizona and would like to see Gilbert return to its rightful place as the Best Place in Arizona to Live and Raise a Family, please vote for me.